Mobility is becoming increasingly important to businesses with trends such as Bring Your Own Device (BYOD) and the Internet of Things (IoT) capable of improving productivity and generating more value. But these developments also bring a range of security and networking challenges. How can enterprises create a mobility strategy that takes advantage of these opportunities effectively and without compromise? This white paper analyzes the key building blocks required to deploy a mobile enterprise infrastructure solution. The discussion focuses on the professional consulting and integration services designed to support a mobile enterprise infrastructure strategic initiative. This white paper provides insight into the key trends and challenges for deploying a mobile solution in today’s enterprise organization. The document also reviews key IBM Global Technology Services offerings in this space. Today, billions of devices, sensors and chips-many of them simple, everyday objects-can communicate with us and with each other. Hospitals can monitor and regulate pacemakers long distance, factories can automatically address production line issues, and hotels can adjust temperature and lighting according to a guest’s preferences, for example. We see the evidence of the mobile transformation all around us. Approximately ten times more smartphones and tablets are sold every day than babies are born. The average person checks their smartphone 150 times a day, or nearly once every six minutes. And the market for wearable devices is projected to grow at least fivefold over the next four years. IBM Institute for Business Value IBM Global Business Services, through the IBM Institute for Business Value, develops fact-based strategic insights for senior executives around critical public and private sector issues. This executive report is based on an in-depth study by the Institute’s research team. It is part of an ongoing commitment by IBM Global Business Services to provide analysis and viewpoints that help companies realize business value. 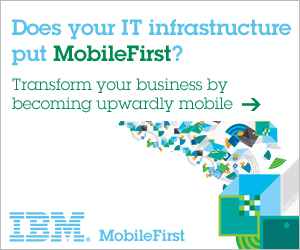 This white paper, based on original IBM research with analysis by IDC, offers a Mobile Infrastructure Maturity Model and documents the best practices and characteristics of organisations that are leaders. The smart phone. The laptop. The tablet computer and the e-reader. These mobile devices are sparking what IDC terms a technological “hyper disruption”—a massive platform shift that occurs only four or five times a century.